(Tech Xplore)—We heard in early studies that Bitcoin used much energy. Digiconomist can take us down memory lane when an investigation into the energy consumption of the Bitcoin network was conducted by Karl J. O'Dwyer and David Malone. According to Digiconomist, they found it plausible that the energy used by Bitcoin mining was comparable to Irish national energy consumption. Well, now there are fresh looks into consumption, "and it seems reality may have finally caught up with their conclusion. According to the Bitcoin Energy Consumption Index the Bitcoin mining network actually passed Ireland in terms of electricity consumption this week, and this time the error margins are significantly smaller." That was from Digiconomist on Nov. 14. What? You mean there are consequences from computers solving all those complex cryptographic problems? Do we need to think about the environmental impact of all this electric usage being used to mine more bitcoins? "It's worth asking ourselves hard questions about Bitcoin's environmental footprint," said Motherboard earlier this month. "If Bitcoin miners were a country they'd rank 61st in the world in terms of electricity consumption," said Power Compare. Mark Wycislik-Wilson in BetaNews put the picture a different way: "At the moment Bitcoin is using up five times the amount of electricity than Europe's largest wind farm currently produces." Alex Hern in The Guardian raised some numbers in yet another novel way: "At those levels of electricity consumption, each individual bitcoin transaction uses almost 300KWh of electricity – enough to boil around 36,000 kettles full of water." Then there was Fast Company's breath-pauser: "Bitcoin mining uses more electricity per year than the country of Oman." Fast Company added, "The global energy required by the bitcoin network, which is responsible for verifying bitcoin transactions, exceeds the annual energy consumption of the Arabian country, reports Digiconimist. The publication estimates that bitcoin mining consumes 30.14TWh of power a year at a cost of $1.5 billion in electric bills." Bitcoin's "mining" network uses more electricity in a year than the whole of Ireland, according to statistics released, said Hern on Monday. Business Insider ran the headline: "The electricity used to mine bitcoin this year is bigger than the annual usage of 159 countries." Daily Sabah said that "the global energy consumption used in the production process of the virtual currency known as "mining" surpasses the individual consumption of 159 individual countries." Power Compare was working out the numbers: "According to Digiconomist's Bitcoin Energy Consumption Index, as of Monday November 20th, 2017, Bitcoin's current estimated annual electricity consumption stands at 29.05TWh. That's the equivalent of 0.13% of total global electricity consumption. While that may not sound like a lot, it means Bitcoin mining is now using more electricity than 159 individual countries," said the London-based, information only website. 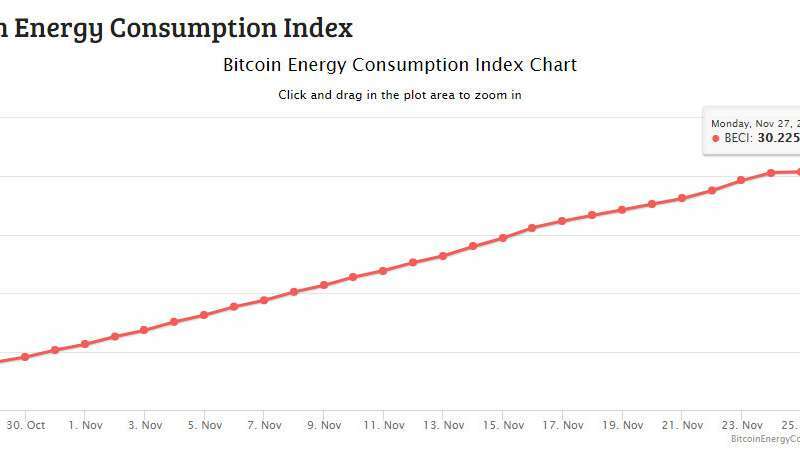 The energy consumption of Bitcoin as investigated by Digiconomist can be checked out via a chart. Oscar Williams-Gruthe in Business Insider commented that "Miners are turning to more powerful computers to complete these tasks and earn bitcoin. As a result, mining (and on the flipside, bitcoin transactions) are sucking up greater and greater amounts of electricity." The issue is that the "mining" is arbitrarily difficult: the work they perform to compute the public transaction ledger doesn't need to involve that much computation, but the difficulty level is automatically adjusted up to keep people from creating infinite number of bitcoins. So it's basically a system designed to reward wasting electricity by dishing out worthless virtual funny-pennies like gaining higher points in Super Mario, which in and of itself would be pointless and irrational if it wasn't for the secondary market where bitcoins are either used to buy drugs and contraband to remain quasi-anonymous, or people buy them simply to gamble on finding a bigger idiot who will pay a little more. All of it is fake-work and originally a scam, as the people who created bitcoin had a very easy time creating millions of the coins before the speculation market picked up and shot the value up to thousands per coin. Now it's just a matter of slowly cashing out.